Did you follow the recent controversy surrounding Shashi Tharoor? What is your take on it? Was it justified? Unjustified? What? Out with it. Splurge your emotions. Articulate! Or just do what my friend’s grandmother did. Blame it on the super-deadly, the killer-dreaded nazar — “Nazar lag gayi, beta. Itna sundar hai, na.” (He’s a victim of ill-meaning looks; he is so handsome, after all.) These words of wisdom bang in the middle of an intense conversation about his position as a public servant. You want to talk about opinions? How’s that for one? 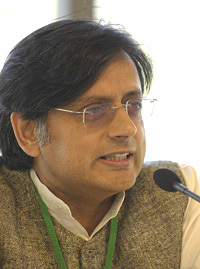 I was 13 when I first heard the precious name uttered: Shashi Tharoor. My English teacher, absolutely unaware of political dynamics, and hence absolutely blissful, said it all. Talking about superlatives (mind you), she squealed excitedly “Shashi Tharoor is the soooo handsommme!” To add fat to the fuel, she added in her native Bengali, “Bhishoon Bhaalo!” The next moment, a few boys rolled their eyes and reported similar incidents at home, when their mothers and sisters would swoon to the floor and go ga-ga about the native dynamo at the U.N. Yes, babies, that sums it all up. Shashi Tharoor. Does that one name say it all? The handsomeness called Shashi Tharoor. Oooh, those puppy dog eyes that can shine with mischief, dynamism, rage, et al; that cherry-red mouth that can twist itself into an endearing smile or a heart-breaking sulk; that imposition of a stately body upon us, one that is clothed in such impeccable style! Shashi Tharoor is a trend. A trend that woman and the ‘youth’ are dying to try to include in the encasement of politics; in the realm of stately drama; as the main ingredient of a national masala; in their very ideals and aspirations. Yet, something goes wrong. That goddamned Twitter is to be blamed. Arrey, what can a national tycoon do if something as deliciously tempting as social networking has washed upon the globe that he so desperately wants to integrate and connect with? “Uss bechaare ki galti nahin, saali social networking ki jaat aisi hai!” (It is not his fault, that damned social networking calls for such behaviour!) Worse — we ought to have good looking politicians! Arrey, look at Sarkozy, Obama, Clinton! Sophistication and looks! And what have we got? No handsome-waale ministers! Tsk, tsk. “No problem, yaar,” my politically ‘knowledgeable’ friend said, “these controversies are very common in a Great Man’s life.” Happens! Every successful story has these potboilers! A breath of fresh air — such a bold opinion, alongside 10-page reports on his recent ‘behaviour’, the two-hour-long ‘breaking news’ reports on his shameful conduct, the debates and discussions about his expulsion as an M.P. added to the recent resignation, and the Opposition’s big smirk. Well, yes. It happens only in India. Welcome aboard. Sneha is a student at I.I.T.-Madras, and is pursuing a five-year integrated M.A. there. She loves reading and writing, especially poetry, and what she calls 'random writing'. She swears that she has never read a Mills and Boon novel. She loves fiction, and has a blog. By Shoaib Daniyal · Nothing epitomises ‘casual’ more than a free-flowing lungi. By Sangeeta Mulay · Dark tourism—travelling to places associated with death, pain, and suffering—is the dirty little secret of the tourism industry. Great work by an extremely competent authoress! Am impressed by the clarity in thought and expression presented in such a pleasant and pleasing manner. Way to go! So nice to see you putting pen to paper again. The article it self is quite well written. Keep it up. A good read, i thought. Very funny and very well written. That is really well written, Congratulations. Well done again. I am sorely tempted to steal some lines. And no wonder our country is in this state of despair! !